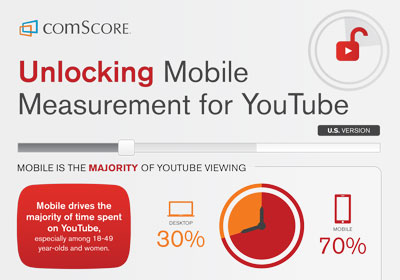 Unlocking Mobile Measurement for YouTube in the U.S. So much of video viewing has shifted from desktop to mobile in recent years, and for YouTube – the largest online video distribution platform – it’s no different. Comscore just announced the introduction of the reporting of new mobile video metrics for YouTube and its channels, enabling Comscore to measure their mobile and multi-platform viewing audiences for the first time. In the following U.S. based infographic, we unlock mobile measurement for YouTube and its channels, and reveal just how massive and fundamental mobile viewing is for today’s digital video consumer.